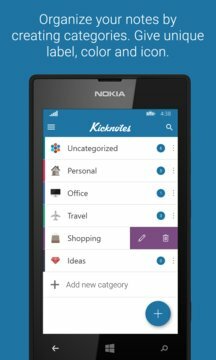 Kicknotes is a free and simple note taking app for Windows Phone. With Kicknotes you can write, record, draw or store your login and payment details. Kicknotes also provide an easy way to organize your notes by creating categories. 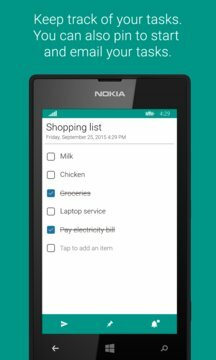 ● Write notes, checklist, record voice, free draw, store login details and payment details. ● Kicknotes gives you a very smooth user experience. ● Never worried about private notes. You can lock your app with 4 digit pass code. ● Backup your whole data and restore it whenever you want. Protect your backup file with AES-256 encryption. ● Tired of writing. Just talk. Kicknotes will take care of converting your voice to text. ● Keep track of your notes by creating reminders. ● Pin a shortcut of your note to start screen to have a quick access. ● Email your notes to your friends and relatives. ● Built-in password generator. Create strong passwords and protect your privacy.